Richard Drew has never done that. Although he has preserved the jacket patterned with Kennedy’s blood, he has never not taken a picture, never averted his eye. He works for the Associated Press. He is a journalist. It is not up to him to reject the images that fill his frame, because one never knows when history is made until one makes it. It is not even up to him to distinguish if a body is alive or dead, because the camera makes no such distinctions, and he is in the business of shooting bodies, as all photographers are, unless they are Ansel Adams. Indeed, he was shooting bodies on the morning of September 11, 2001. On assignment for the AP, he was shooting a maternity fashion show in Bryant Park, notable, he says, “because it featured actual pregnant models.” He was fifty-four years old. He wore glasses. He was sparse in the scalp, gray in the beard, hard in the head. In a lifetime of taking pictures, he has found a way to be both mild-mannered and brusque, patient and very, very quick. He was doing what he always does at fashion shows — “staking out real estate” — when a CNN cameraman with an earpiece said that a plane had crashed into the North Tower, and Drew’s editor rang his cell phone. He packed his equipment into a bag and gambled on taking the subway downtown. Although it was still running, he was the only one on it. He got out at the Chambers Street station and saw that both towers had been turned into smokestacks. Staking out his real estate, he walked west, to where ambulances were gathering, because rescue workers “usually won’t throw you out.” Then he heard people gasping. People on the ground were gasping because people in the building were jumping. He started shooting pictures through a 200mm lens. He was standing between a cop and an emergency technician, and each time one of them cried, “There goes another,” his camera found a falling body and followed it down for a nine- or twelve-shot sequence. He shot ten or fifteen of them before he heard the rumbling of the South Tower and witnessed, through the winnowing exclusivity of his lens, its collapse. He was engulfed in a mobile ruin, but he grabbed a mask from an ambulance and photographed the top of the North Tower “exploding like a mushroom” and raining debris. He discovered that there is such a thing as being too close, and, deciding that he had fulfilled his professional obligations, Richard Drew joined the throng of ashen humanity heading north, walking until he reached his office at Rockefeller Center. 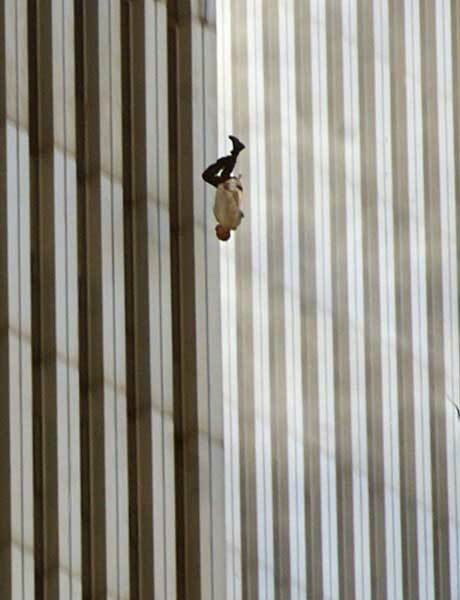 They began jumping not long after the first plane hit the North Tower, not long after the fire started. They kept jumping until the tower fell. They jumped through windows already broken and then, later, through windows they broke themselves. They jumped to escape the smoke and the fire; they jumped when the ceilings fell and the floors collapsed; they jumped just to breathe once more before they died. They jumped continually, from all four sides of the building, and from all floors above and around the building’s fatal wound. They jumped from the offices of Marsh & McLennan, the insurance company; from the offices of Cantor Fitzgerald, the bond-trading company; from Windows on the World, the restaurant on the 106th and 107th floors — the top. For more than an hour and a half, they streamed from the building, one after another, consecutively rather than en masse, as if each individual required the sight of another individual jumping before mustering the courage to jump himself or herself. One photograph, taken at a distance, shows people jumping in perfect sequence, like parachutists, forming an arc composed of three plummeting people, evenly spaced. Indeed, there were reports that some tried parachuting, before the force generated by their fall ripped the drapes, the tablecloths, the desperately gathered fabric, from their hands. They were all, obviously, very much alive on their way down, and their way down lasted an approximate count of ten seconds. They were all, obviously, not just killed when they landed but destroyed, in body though not, one prays, in soul. One hit a fireman on the ground and killed him; the fireman’s body was anointed by Father Mychal Judge, whose own death, shortly thereafter, was embraced as an example of martyrdom after the photograph — the redemptive tableau — of firefighters carrying his body from the rubble made its way around the world. And so it went. In 9/11, the documentary extracted from videotape shot by French brothers Jules and Gedeon Naudet, the filmmakers included a sonic sampling of the booming, rattling explosions the jumpers made upon impact but edited out the most disturbing thing about the sounds: the sheer frequency with which they occurred. In Rudy, the docudrama starring James Woods in the role of Mayor Giuliani, archival footage of the jumpers was first included, then cut out. In Here Is New York, an extensive exhibition of 9/11 images culled from the work of photographers both amateur and professional, there was, in the section titled “Victims,” but one picture of the jumpers, taken at a respectful distance; attached to it, on the Here Is New York Website, a visitor offers this commentary: “This image is what made me glad for censuring [sic] in the endless pursuant media coverage.” More and more, the jumpers — and their images — were relegated to the Internet underbelly, where they became the provenance of the shock sites that also traffic in the autopsy photos of Nicole Brown Simpson and the videotape of Daniel Pearl’s execution, and where it is impossible to look at them without attendant feelings of shame and guilt. In a nation of voyeurs, the desire to face the most disturbing aspects of our most disturbing day was somehow ascribed to voyeurism, as though the jumpers’ experience, instead of being central to the horror, was tangential to it, a sideshow best forgotten. It was no sideshow. The two most reputable estimates of the number of people who jumped to their deaths were prepared by The New York Times and USA Today. They differed dramatically. The Times, admittedly conservative, decided to count only what its reporters actually saw in the footage they collected, and it arrived at a figure of fifty. USA Today, whose editors used eyewitness accounts and forensic evidence in addition to what they found on video, came to the conclusion that at least two hundred people died by jumping — a count that the newspaper said authorities did not dispute. Both are intolerable estimates of human loss, but if the number provided by USA Today is accurate, then between 7 and 8 percent of those who died in New York City on September 11, 2001, died by jumping out of the buildings; it means that if we consider only the North Tower, where the vast majority of jumpers came from, the ratio is more like one in six. Eric Fischl did not go away. Neither did he turn away or avert his eyes. A year before September 11, he had taken photographs of a model tumbling around on the floor of a studio. He had thought of using the photographs as the basis of a sculpture. Now, though, he had lost a friend who had been trapped on the 106th floor of the North Tower. Now, as he worked on his sculpture, he sought to express the extremity of his feelings by making a monument to what he calls the “extremity of choice” faced by the people who jumped. He worked nine months on the larger-than-life bronze he called Tumbling Woman, and as he transformed a woman tumbling on the floor into a woman tumbling through eternity, he succeeded in transfiguring the very local horror of the jumpers into something universal — in redeeming an image many regarded as irredeemable. Indeed, Tumbling Woman was perhaps the redemptive image of 9/11 — and yet it was not merely resisted; it was rejected. The day after Tumbling Woman was exhibited in New York’s Rockefeller Center, Andrea Peyser of the New York Post denounced it in a column titled “Shameful Art Attack,” in which she argued that Fischl had no right to ambush grieving New Yorkers with the very distillation of their own sadness…in which she essentially argued the right to look away. Because it was based on a model rolling on the floor, the statue was treated as an evocation of impact — as a portrayal of literal, rather than figurative, violence. “I was trying to say something about the way we all feel,” Fischl says, “but people thought I was trying to say something about the way they feel — that I was trying to take away something only they possessed. They thought that I was trying to say something about the people they lost. ‘That image is not my father. You don’t even know my father. How dare you try telling me how I feel about my father?’ ” Fischl wound up apologizing — “I was ashamed to have added to anybody’s pain” — but it didn’t matter. All over the world, people who read Peter Cheney’s story believe that Norberto died by jumping out a window. People have written poems about Norberto jumping out a window. People have called the Hernandezes with offers of money — either charity or payment for interviews — because they read about Norberto jumping out a window. But he couldn’t have jumped out a window, his family knows, because he wouldn’t have jumped out a window: not Papi. “He was trying to come home,” Catherine says one morning, in a living room primarily decorated with framed photographs of her father. “He was trying to come home to us, and he knew he wasn’t going to make it by jumping out a window.” She is a lovely, dark-skinned, brown-eyed girl, twenty-two years old, dressed in a T-shirt and sweats and sandals. She is sitting on a couch next to her mother, who is caramel-colored, with coppery hair tied close to her scalp, and who is wearing a cotton dress checked with the color of the sky. Eulogia speaks half the time in determined English, and then, when she gets frustrated with the rate of revelation, pours rapid-fire Spanish into the ear of her daughter, who translates. “My mother says she knows that when he died, he was thinking about us. She says that she could see him thinking about us. I know that sounds strange, but she knew him. They were together since they were fifteen.” The Norberto Hernandez Eulogia knew would not have been deterred by smoke or by fire in his effort to come home to her. The Norberto Hernandez she knew would have endured any pain before he jumped out of a window. When the Norberto Hernandez she knew died, his eyes were fixed on what he saw in his heart — the faces of his wife and his daughters — and not on the terrible beauty of an empty sky. She knows what he was wearing because of her determination to know what happened to her sons on that day — because of her determination to look and to see. She did not start with that determination. She stopped reading the newspaper after September 11, stopped watching TV. Then, on New Year’s Eve, she picked up a copy of The New York Times and saw, in a year-end review, a picture of Cantor Fitzgerald employees crowding the edge of the cliff formed by a dying building. In the posture — the attitude — of one of them, she thought she recognized the habits of her son. So she called the photographer and asked him to enlarge and clarify the picture. Demanded that he do it. And then she knew, or knew as much as it was possible to know. Both of her sons were in the picture. One was standing in the window, almost brazenly. The other was sitting inside. She does not need to say what may have happened next. Jonathan Briley’s father is a preacher, a man who has devoted his whole life to serving the Lord. After September 11, he gathered his family together to ask God to tell him where his son was. No: He demanded it. He used these words: “Lord, I demand to know where my son is.” For three hours straight, he prayed in his deep voice, until he spent the grace he had accumulated over a lifetime in the insistence of his appeal. But when Timothy identified his brother’s body, none of his clothes were recognizable except the black shoes. And when Jonathan went to work on the morning of September 11, 2001, he’d left early and kissed his wife goodbye while she was still sleeping. She never saw the clothes he was wearing. After she learned that he was dead, she packed his clothes away and never inventoried what specific articles of clothing might be missing.